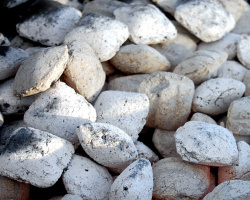 How can I reuse or recycle charcoal ashes from my barbecue? | How can I recycle this? How can I recycle charcoal from the BBQ? At the moment it’s still sitting in there but need to clean it out soon. Any suggestions instead of chucking it out? 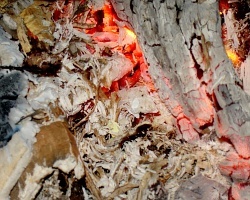 As I’ve said before in relations to ashes from bonfires, ash from wood fires – untreated, unpainted wood – can be used in the compost heap or in the garden to bring down the acidity of the compost/soil (don’t use too much though, then it’ll get too alkaline). But most of the charcoal briquettes that people use on barbecues tend to have random things added that you wouldn’t necessarily want in your compost heap – so unless you know they’re 100% wood based, it would be safer to leave them off your heap/veg plot. So any there any things that can be done with them instead? My parents have a cinder path round their vegetable patch: they just poured ashes on to it and let the foot traffic going to and from the compost heap do the rest. It used coal ashes, though. I always use them for my strawberries and other berries – they love it. This is my first post on this site, so I don’t know if this idea is what people are looking for or not, but: if you have and use a Dry Erase board, ashes (any type) work extremely well in cleaning it off. Just take a regular piece of tissue/paper towel, etc., dip it in the cool ashes, and then rub the board for a nice clean surface. This website suggest placing charcoal in an egg carton, and using the egg carton as a fire starter. okay, but we are not looking at starting a fire. rather disposing of the last one. I love your idea of using the egg carton as a firestarter. I didn’t know I wasn’t supposed to recycle the ashes from charcoal briquettes that way so I did. I have always used my charcoal ashes on the trees surrounding my yard. Can’t be too toxic as they’ve all gone from being scrawny 3-4 feet over the past few years to growing a very healthy 30-40 feet tall. They are good for cleaning metal surfaces and utensils. they work as good as the comet soap powder. if you live in a place where it snows.. put ashes under your tires if your car is stuck in the snow and the tires grip to it and can pull itself free very easily. or just sprinkle your driveway if it’s icy before driving. If you buy “lumpwood” charcoal (as opposed to briquettes) it’s generally OK to use in the same way you would use wood ash. Lumpwood charcoal is widely available. NO, No charcoal ashes are awesome for gardens. My aunt who actually lives on the largest farm in west Tennessee. Well she literally grows dozens and dozens of variety of vegetables and fruit trees. Well they have these big wild boar BBQ and other BBQ but they always save the charcoal ash. fertilize as my uncle says fertilize but it works wonder on amending soils. Thanks. I like this idea too. I know this thread is pretty old (couple of years) buy this is a new issue for me. I’ve been cooking a lot on the smoker this year and I saved a whole bucket full of ashes. I’m anxious to try them out in the garden. Thanks to all who posted advice! I think the ashed of charcoal would be better to be recycled to a whitening toothpaste. It whitens the teeth when you brush with charcoal ash. I have already tested and found it as above. I doubt that charcoal briquettes from a BBQ would have any harmful substance in it. The smoke from the fire permeates the meat being cooked. Any harmful substance woud be consumed directly. Manufacturers would certainly not want to poison the millions who love their BBQ’s. They would also be aware that litigation could cost them millions. I am happy therefore to use the charcoal in my garden compost. Charles pretty much offered up the point I was going to make. It is highly doubtful that any product that has been made by a large corporation for many years and so closely permeates food would have any toxic ingredients in it. As far as I can tell, briquettes are made from about 90% traditional charcoal with some coal and unburned wood (for flavor). The rest is made up of corn starch (binder), nitrate (accelerant) and lime (to indicate the briquettes have burned); all innocuous materials or things one adds to gardens all the time. In fact, if there are any toxic chemicals, they are more likely to be in traditional charcoal itself. Hmmm, something safe like asbestos? Don’t assume something is safe just because the manufacturer uses it. Also, the ash will change the pH of the soil. Ancient thread but it’s obviously still coming up in search engines due to limited info on the topic. My two cents in regards to the last few posts… have you not read the blatant warning labels on Kingsford? (or any brand charcoal “briquette”) Clearly states that it’s use has known health risks and hazards. Cancer being the obvious one. Just because the FDA allows us to put something in our bodies DOES NOT MAKE IT OK!! Expand your thinking people. That’s like saying crystal meth is ok because it’s mostly sudafed based and just because that’s something approved by healthcare professionals, it’s somehow ok to use. Not wise. It’s the HIGH HEAT and CHARING of any meat that produces heterocyclic amines and polycyclic aromatic hydrocarbons that CAN cause cancer in Some people, Some of the time. Gas grills have the SAME dangers. The lighter fluid lighter fluid produces volatile organic compounds that are possible carcinogens for SOME of the people, SOME of the time. I use homemade fire starters with kindling and don’t use petros. Regarding the post from b-ry, the warning on Kingsford’s web site says: “California Proposition 65 Warning: Combustion (burning) of this product, like other cooking methods, produces carbon monoxide and other substances known by the State of California to cause cancer, birth defects or reproductive harm.” However, I believe they are referring to the method of grilling, not to cancerous chemicals in the charcoal. Any time you char meat, you are increasing the risk of carcinogens, but that’s due to the flame’s effect on the meat. Once the charcoal is reduced to ashes, there’s very little left to worry about. I agree with what b-ry says. Only drugs and food are tested and checked. There is legislation in the US to have more substances tested. IF you have any food drippings in your ash it will get the attention of your or your neighbors dog, or maybe local wildlife. I like the idea of using it to add traction to an icy driveway. This may be so, but look at all the products they’ve said would kill us then it turned out we all would have been much healthier had we just followed grandma’s example and eaten the product all along. As for the meds they also okayed for ingestion, tell that to the people who dead or dying because they literally put their lives in the hands of the FDA who are “compensated” by pharma companies. As for me I choose to follow the example of all the 80-90 y/o grandma’s and grandpa’s around the world. Has anyone used this type of ash for curing hides? I used to use oak ash in Alaska and wondered it it would work with BBQ ash. Good quality ash is used as a fertilizer for many plants. It contains potash that increases the pH level of the soil. Mix it with water and spray around your vegetable garden. It prevents the growth of unwanted beetles, lice, mites and more. Keep it in a perforated bag and refrigerate. Place it in your shoes to reduce odor whenever required.